A wanted man becomes visible under thin coffee. A Wanted Man on Chelsea’s Kings Road is unusual in many respects. Firstly, never before have I been to an espresso ‘canteen’, but then, neither have I had a coffee in a café that is part coffee-shop part waxing salon. While both wax based hair removal and coffee rely on bees, this is surely not the connection between these two enterprises. Nonetheless, once your coffee-loyalty card is full, you can choose: free brow shape, bikini wax or coffee. The coffee comes from Common Man Coffee Roasters in Singapore so it would be interesting to know how it was transported to Chelsea in order to retain its freshness, surely each batch is not flown in? On our first visit, we had a rich and smooth long black, a lovely aromatic banana bread and a good hot chocolate (with soy milk). There is plenty of seating in the front of the café and some more towards the back near the bar which was all fairly empty on our first visit but far more crowded (with singly-occupied tables) on my second visit (see below). 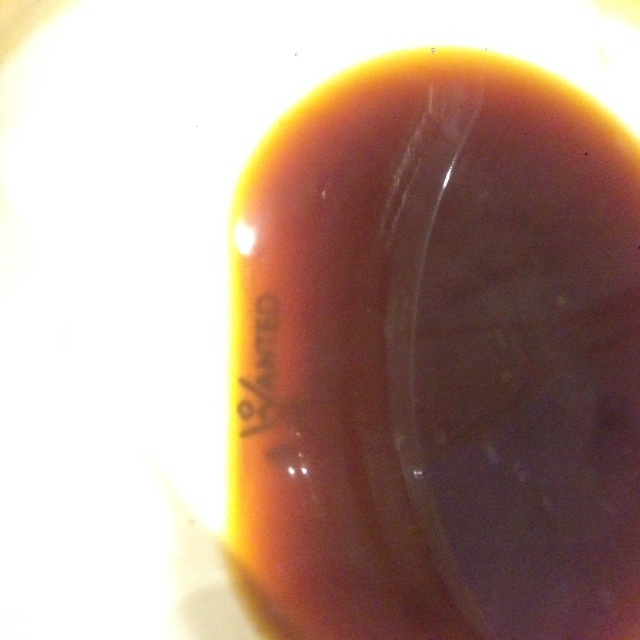 As I drank my coffee, hidden wording became visible at the bottom of the cup. 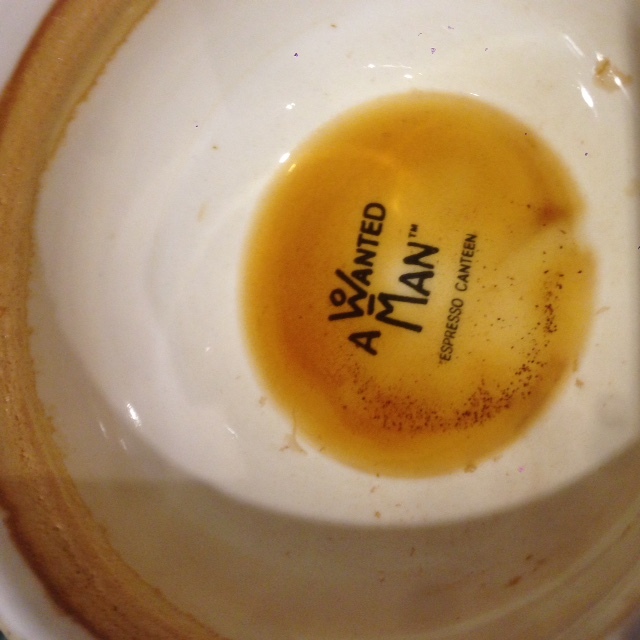 “A wanted man” appeared beneath the coffee when the coffee was sufficiently thin. 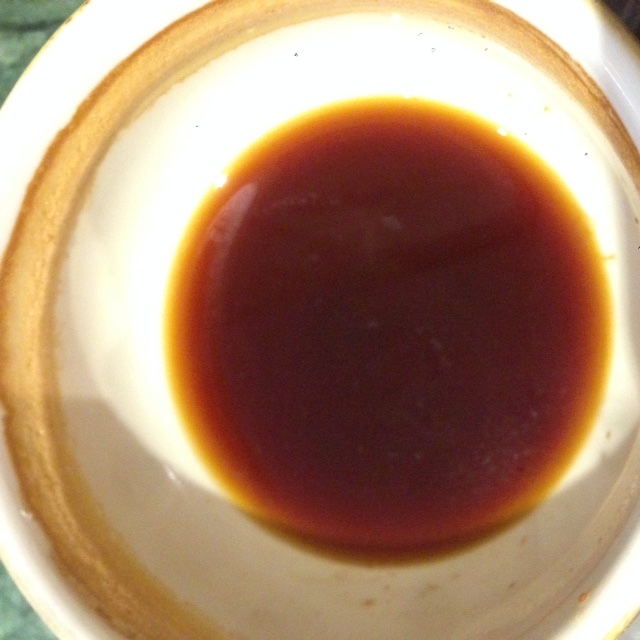 By tilting the cup, this “critical” thickness could be estimated, as you can see in the photos. Ah-ha I thought, the physics bit of this cafe-physics-review will be easy! The absorption of light (which we could measure by the visibility of the writing at the bottom of the cup) is directly proportional to the thickness of the absorbing liquid, the coffee. This is the Beer-Lambert law which describes how light is absorbed through substances such as coffee in which there are molecules and bits of sediment that absorb light (which is ultimately why coffee appears brown). Could I experimentally verify this bit of the Beer-Lambert law by somehow quantifying the visibility of the wording as a function of cup-tilt angle? Before I had thought that far, I had finished the coffee, however the second part of the Beer-Lambert law could be tested by having another coffee on a separate occasion. The other part of the Beer-Lambert law states that the absorption (that’s the (in)visibility of the wording on the cup in this case) is also directly proportional to the concentration of the absorbing molecules/sediment. This makes sense, weak coffee is far more transparent than overly extracted coffee. On my second visit, the coffee tasted slightly stronger, a bit different from my memories of the first occasion. Did the “A wanted man” become visible at a different tilt angle? I would guess – or perhaps that should read ‘hypothes-ise’ – that the angle on the second occasion would have to be lower (that the coffee would have to be thinner generally). However, while sipping my coffee (before getting to the tilt-angle-test) and looking around the second time I noticed that all along the wall where previously there had been plenty of empty tables, each one was now singly occupied by somebody using a laptop, a phone/tablet or in one case, both of these items together. This second time, my mind started wandering into more social issues, while looking at our screens and immersed in social media, are we able to see more or less, than our less absorbed fellow citizens? Does social media clarify the detail or cloud important aspects of our understanding? Does social media do this to you? The light absorption of a coffee is determined by the thickness of the coffee and concentration of absorption sites within it. After considering these two points, it became clear that in some ways they are connected. Admittedly a loose connection, and not one that is strictly scientific but perhaps it’s worth ‘running with it’ for a bit and seeing if it leads anywhere. Just as with the Beer-Lambert law with coffee, the more ‘interacting sites’ (or absorption sites) we encounter on social media, the harder it is to see through to the bottom. Twitter, Facebook etc. can be enormously helpful for widening our networks and learning about new things. But, as has been frequently pointed out elsewhere, they can also become quite unhelpful when we are in an “echo chamber” or when we think that points can be made in mere soundbites. Is it possible that the more absorbing and reflecting sites that we encounter, the harder it is to see anything to any greater depth? What we need is time-out, for self-reflection and for considering points made by others, on Twitter, Facebook and elsewhere. Perhaps the best way to end such a post is with a long quote by somebody else. In fact, the same person (and in the same book) as was quoted at the beginning of this article. Perhaps it would be something to consider while we drink our coffees and hover over the ‘retweet’ or ‘share’ button. Are we helping to probe the depths of our cup by the links we share, or are we merely adding to absorption sites in soundbites in our networks?